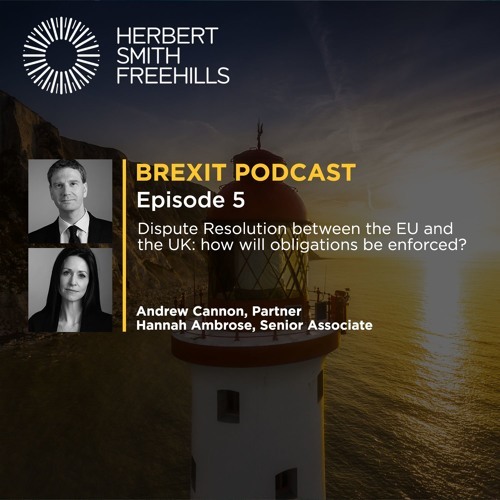 Andrew Cannon and Hannah Ambrose discuss dispute resolution between the UK and the EU. They look at the way in which the withdrawal agreement may be enforced, including the possible role of the CJEU, as well as considering how disputes may be resolved in the event of "no deal". Download Brexit EP5: Dispute Resolution between the EU and the UK: how will obligations be enforced? Users who like Brexit EP5: Dispute Resolution between the EU and the UK: how will obligations be enforced? Users who reposted Brexit EP5: Dispute Resolution between the EU and the UK: how will obligations be enforced? Playlists containing Brexit EP5: Dispute Resolution between the EU and the UK: how will obligations be enforced? More tracks like Brexit EP5: Dispute Resolution between the EU and the UK: how will obligations be enforced?